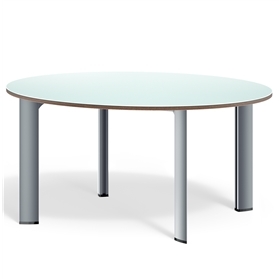 Superbly engineered and with a robust, assured design, Apollo is a contemporary meeting and conference table range. Available in a broad range of dimensions and forms, Apollo is a stylish collection fit for a variety of workplace environments. Featuring a selection of table top finishes, the distinctive extruded leg detail comes in polished aluminium as standard or optional painted silver, black or white.